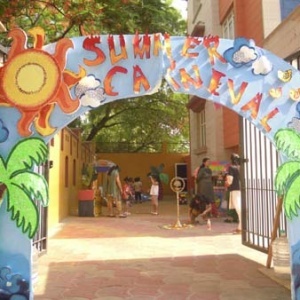 K.R.Mangalam World School, Paschim Vihar celebrated the arrival of summer season by organizing a sizzling ‘Summer Carnival’ on 3 May 2011. The celebrations started with a watermelon cutting ceremony performed by the honourable Principal of school, Ms. Meenu Kanwar and the chief guest Dr. Jasmeet Kaur Wadhwa. It was followed by a trip to a vibrant ‘Goan’ beach created in the school premises. 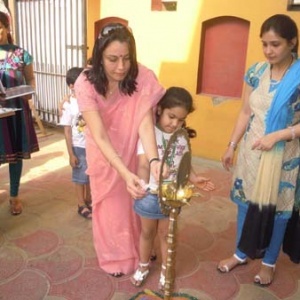 Mother’s Day celebrated was also organised on the same day wherein exciting competitions like Kitchen queen, free style dancing, nail art/tattoo making, best out of waste were conducted for the exhilarated mothers. It was a thrilling experience for the young mothers and for their wards. 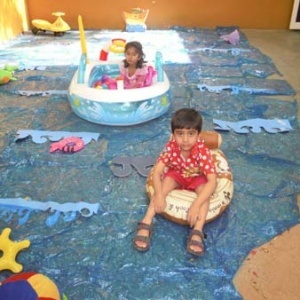 The fortnight was full of heart drenching activities conducted in the class like T-shirt printing, origami fans, sail boat making, lunch at beach, splash pool, beverage day etc. 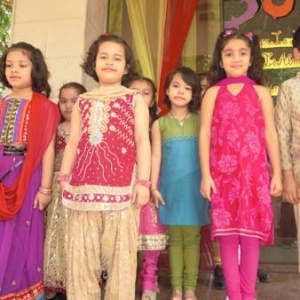 The culmination of the carnival arrived with an exhibition of all the work done during the carnival by the tiny-tots of classes Nursery to class I and also an inter-house dance competition where scintillating performances were presented by the students on the theme ‘Indian States’.